The new water year began with promise last October, but the promise for an abundant water supply waned by the end of December. The San Miguel, Dolores, Animas & San Juan, Colorado, and Upper Rio Grande basins all showed October precipitation totals of 140% of normal or better. Other basins also received above normal precipitation for the month with much of the state’s precipitation falling in the form of early season snow. November precipitation totals continued the above normal trend across the state in all but the San Juan Mountain Range and on the Grand Mesa where snowfall was less prevalent. But ultimately October’s precipitation boom was outweighed by the bust of December. Last month the Gunnison River basin experienced the state’s best monthly basin-wide precipitation totals at a meager 74% of normal. 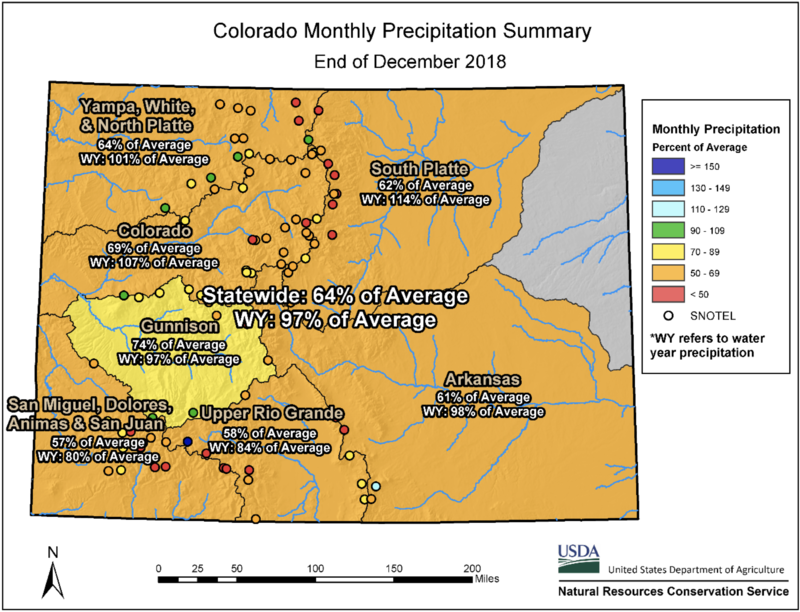 Summarizing the state’s totals, “On January 1, 2019 precipitation is currently at 97% of normal and snowpack is at 93% of normal, considerably better than this time last year when totals were 50% and 54% of normal respectively,” comments Brian Domonkos, Hydrologist with the USDA’s Colorado Natural Resources Conservation Service. At the watershed level, current snowpack conditions are also much improved compared to last year. For example, this year snowpack in the Upper Rio Grande is currently at 70% of normal where last year at this time snowpack was 29% of normal. Similarly, snowpack in the combined San Miguel, Dolores, Animas & San Juan basins is currently 66% of normal where last year snowpack was 22% of normal. After a below normal December, Colorado’s snowpack is approaching a pivotal point during the winter. Domonkos continues, “The middle of January typically marks the midpoint of reaching the annual snowpack peak across the state of Colorado.” The state is little more than a week away from the halfway mark meaning recent snowfall rates will need to pick up considerably for all of Colorado’s river basins to come close to a normal snowpack for streamflow runoff. In particular, southwestern Colorado needs to make up deficits from last year’s shortage of snowpack and depleted reservoir storage. Statewide reservoir levels are below normal for this time of year at 81% of normal. Reservoir deficits from last year in the Gunnison and San Miguel, Dolores, Animas & San Juan basins continue to persist after an unusually dry winter last year. For more detailed information about January 1 mountain snowpack refer to the January 1, 2019 Colorado Water Supply Outlook Report. For the most up to date information about Colorado snowpack and water supply related information, refer to the Colorado Snow Survey website.